Do I Smell Something Funny? Guadalupe River Park is well known by the local bird watching community for its diverse bird population but few visitors realize how many small and midsize mammals call the river park home. You may be even more surprised to find the river, even in the heart of downtown, is home to a thriving population of Striped Skunk (Mephitis mephitis). The Striped Skunk is found throughout most of California. About the size of a large house cat these handsome animals sport a black coat with a wide white stripe starting at the head, going down the back to the tail. The tail is thick, full, and bushy and may have additional white hairs. While black and white is the most common color pattern, scientists have documented some variation including seal brown, all white, and yellow. Striped Skunks are best known for the specialized musk glands found under their tails. These glands are paired and surrounded by strong muscles that are capable of spraying the yellowish colored and extremely strong smelling musk several yards. Striped Skunks can also change the pattern of the spray from a mist like pattern to a more common short stream of larger droplets. The musk of the Striped Skunk is not only pungent but is a strong irritant to the eyes and ingestion can cause severe discomfort or even death in other mammals. 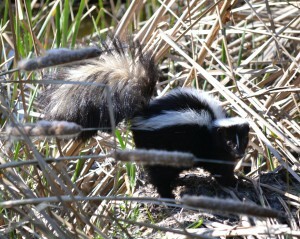 Skunks use the musk as a defense to protect themselves and their young from predators. Skunks are primarily insect eaters feeding on grasshoppers, beetles, crickets, grubs and other large insects. In areas where insects are hard to find skunks will eat a wide variety of food such as eggs, mice, voles, fruits, berries, and ground nesting birds. While many predatory mammals will eat skunk if food is scarce skunk is not a preferred food item. The largest predators of Striped Skunks are the birds of prey such as the Great Horned Owl, Eagles, and large hawks. Striped Skunks are active at night. They will begin their active time about 1 hour before sunset and return to their dens about dawn. Striped Skunks are very docile and non aggressive animals. The cost common reason for conflict between skunks and other species, including people, is surprising or cornering a skunk. When surprised a skunk will often display a threat posture where they arch their backs, raise their tail, stamp their front feet and walk backwards. If the other animal or person does not back away, or the skunk feels too surprised to give a warning, the skunk will turn its tail towards the threat and spray its potent musk in defense. Visitors using the trail just after sunrise or just before sunset may see a Striped Skunk start out on it’s night time search for food. At least one family of 5 young have been seen near the Taylor St. over crossing and several adults have been seen from Coleman Ave. to Alviso. Like all wildlife, please watch from a respectful distance and never try to handle or capture any animal that appears sick or injured. Please report sick or injured wildlife to the park rangers or animal services.